CHATHAM — Clutching the handle of his net, C.T. Harry lurched forward from a crouching position and charged from the base of the sand dune toward the crashing waves. As he neared the injured gray seal, dozens of others scattered, using their flippers to drag themselves into the Atlantic Ocean. Seconds after Harry draped the net over the wounded pinniped, his colleagues from the International Fund for Animal Welfare rushed to his aid, gauze and antibiotics in hand. Their goal was to remove the blue, wiry netting that was cutting deep — through skin, blubber, and muscle — into the animal’s neck. It was all in a day’s work for the team of researchers, who sweep the coast to document and rescue distressed and stranded marine life, including the abundance of gray seals that dot the beaches of Cape Cod. A team from the International Fund for Animal Welfare works to free seals entangled by buoy ropes, fishing line, nets, and other life-threatening materials. On a nearly cloudless Friday morning, four members of the IFAW, a nonprofit organization based in Yarmouth, traveled with officials from the US Fish and Wildlife Service to the Monomoy Islands. The islands’ 8 miles of federally protected beaches form part of the Monomoy National Wildlife Refuge. 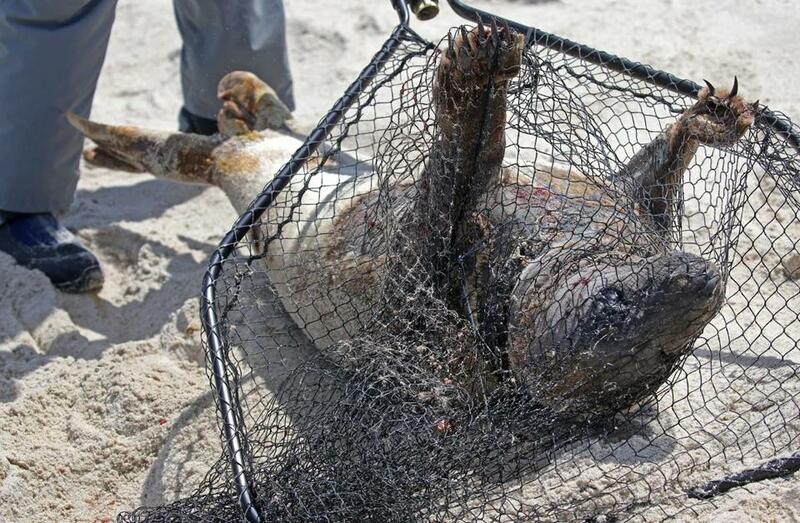 A netted and injured gray seal was inspected by an IFAW member. They were there in search of seals entangled by buoy ropes, fishing line, nets, and other life-threatening materials. 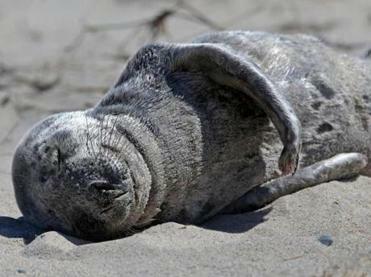 According to the IFAW, many seals get entangled at a young age. As they grow, reaching up to 800 pounds, the debris around their necks becomes tighter, sawing into their flesh and eventually killing them. “It’s basically like being strangled for five years, slowly,” Harry said. The islands — South Monomoy, North Monomoy, and Minimoy — are flanked by the Atlantic Ocean and Nantucket Sound and are a favored spot for thousands of seals. This was evidenced last month by a viral video that showed them piled chockablock with each other like beachgoers at Coney Island. Some have argued, however, that the population explosion of hungry seals has affected the fishing industry. Researchers also say the seals have attracted more great white sharks to Cape Cod. But those assertions, Harry said, don’t justify allowing individual seals to suffer slow and agonizing deaths. “There is a direct welfare component to the work that we do,” he said. The team arrived on the sound side of the southernmost island last week on a 23-foot boat that was launched from the wildlife refuge’s visitor center. Anchoring just beyond the shore, the team jumped into the water and carried gear to the beach. Once the boat was unloaded, they stripped off the bright orange “Gumby” survival suits that they wear while traveling to the islands when the temperature of the water and atmosphere combined is less than 100 degrees. Free of the dexterity-limiting suits, the crew packed up and hiked over the dunes to the Atlantic side. Not long into their trek, they spotted in the distance a large gray seal with a thin monofilament fishing line wound tightly around its neck. Because of the seal’s size and its proximity to the water — an easy escape — Harry knew he couldn’t execute a successful rescue. All they could do was stare out at the cluster of sea creatures, and contemplate the seal’s fate. Moving along the sand ridge, which was peppered with a Mohawk of spiky dune grass that crunched under their feet, Harry and his team continued to scan the horizon. Katherine McKenna, an apprentice with the IFAW, suddenly observed “the ideal candidate” — the small, isolated seal entangled in the blue netting. The group raced into action. Once Harry had captured the seal in his net, the team diligently went to work. Olivia Guerra, an intern, straddled the seal, making sure it didn’t wiggle free. Harry and McKenna unpacked materials and then used a bottle of fresh water to clean the seal’s deep wound. The blue netting was snipped away with scissors, and a rust-colored disinfectant was poured over the wound. From there, the team applied a white antibacterial cream typically used in trauma wards for burn patients. This was all followed by an antibiotic shot, before the animal was marked with pink paint and its tail tagged by McKenna. The entire process unfolded in an instant, as the seal let out moans that sounded like a muffled fire alarm. The seals that had fled into the ocean watched curiously from afar as they bobbed with the waves. When the commotion subsided, the young seal was released. It scurried down the beach to the ocean to join the others, leaving a trail in the sand. Harry threw two thumbs in the air to punctuate the team’s success. And then they were off again, walking down the wind-whipped beach toward the next crowd of sunbathers.